Magic By Jadugar Anand is an event that took place between 05-Apr-2007 and 18-May-2007 in Hyderabad. He probably can create money out of thin air. However, people are only too willing to pay him. You will be, too, if you read all he can do. Jadugar Anand is back again this year, performing two shows daily from 5th April to 18th May, at the Hari Hara Kala Bhavan. The first show starts at 4:00pm and the second one at 7:00pm. Anand’s show in Hyderabad kickstarted on 25th March with a fire escape show at NTR Stadium by his son Akash, a member of Anand’s crew. Akash performed the stunt, wherein he was chained with 20 locks and thrown into a hige burning haystack. He came out of the flames after releasing himself from the chains, unscratched. This stunt was followed by blindfolded bike rides in the city, covering 21 kilometres from Hari Hara Kala Bhavan via Sangeet Theatre, Mettuguda, Tarnaka, OU campus, RTC X Roads, Koti, Nampally, Tank Bund, Ranigunj and Paradise, back to Hari Hara Kala Bhavan. The stunt was performed to highlight safe driving and create traffic awareness. Jadugar Anand is the President of the All-India Magic Federation, which has nearly 60,000 members from among professional and amateur magicians and magic lovers. He has over 28,000 shows to his credit, all over the world. A professional for 36 years, Anand has travelled far and wide. Over the years he has innovated a lot of tricks and earned the reputation of being the fastest magician in the world. Anand hails from Jabalpur in Madhya Pradesh. He learnt hypnotism from spiritual guru Rajneesh (Osho), who also hails from the same place. He learnt magic at the age of 7, apparently inspired by street magicians, who used to get him laddoos from nowhere. Anand has performed many new magic tricks, including making the Statue of Liberty and the Taj Mahal disappear, making an elephant appear from thin air, and bringing characters of movies alive from the screen and sending them back. During the month-long show, get to see some stunning tricks from the colorful mayalok of the Jadugar. The entry to the shows is by tickets of Rs. 80, Rs. 150, Rs. 200 & Rs. 300 per head, available at the venue. For further details, please contact the venue at 2780-7740. Excellent, cannot express but only can be viewed. greatest show i have ever seen lively. Tnx Anand Sie for entertaining us. fullhyd.com has 700,000+ monthly visits. 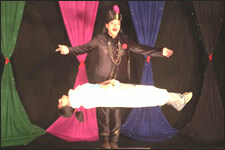 Tell Hyderabad what you feel about Magic By Jadugar Anand!